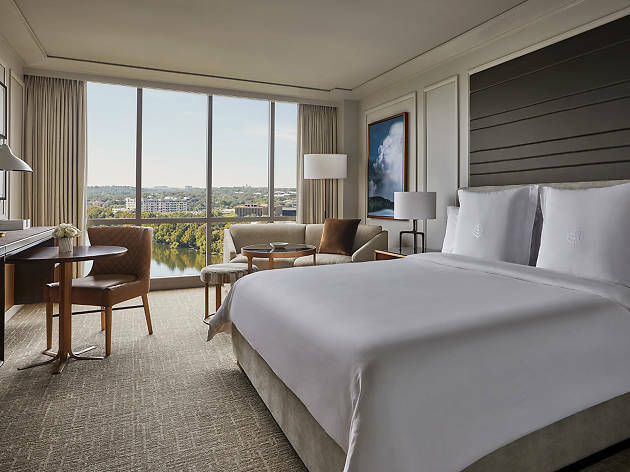 The growing number of things to do in Austin year-round has been drawing record numbers of visitors to the city—meaning the best Austin hotels are truly spectacular places to stay. From downtown hotels boasting Austin's best spas and hotel bars to stylish boutiques tucked away in chic neighborhoods, these hotels are perfect for resting your head after a long day of sightseeing. We’ve focused on the places with comfortable rooms, some of the best bars and best restaurants in Austin, and a certain X-factor. Make sure you’re coming back to one of the best hotels in Austin every night during your next stay. Looking for more options? 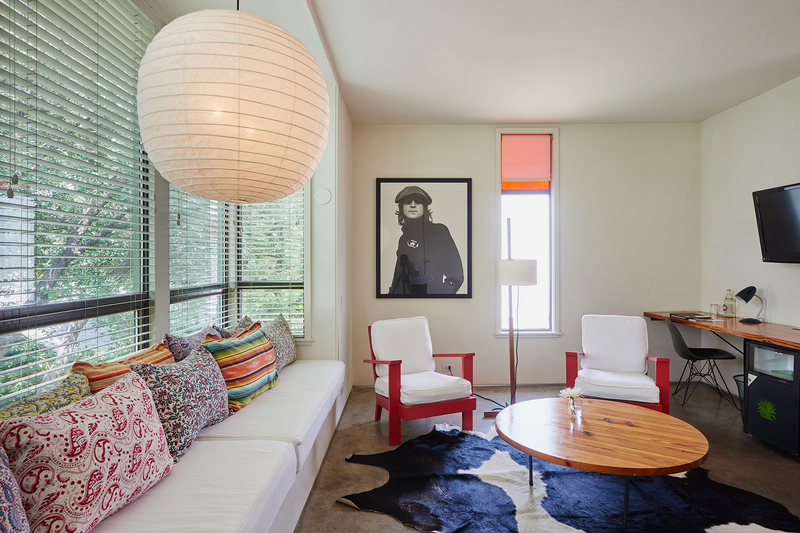 Check out our pick of the coolest Airbnb Austin rentals. 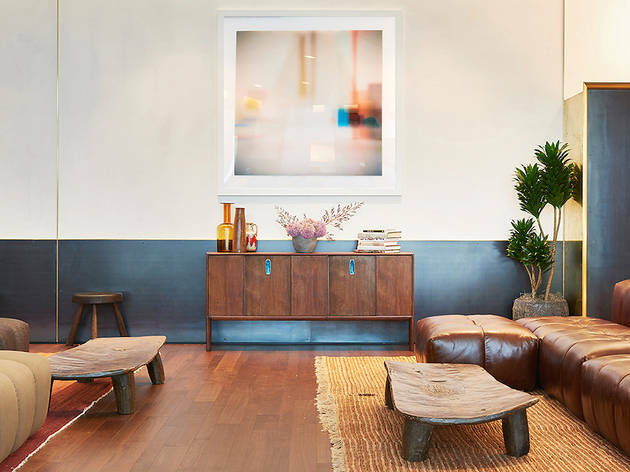 Hotelier Liz Lambert now boasts a small empire of boutique hotels in Austin, San Antonio and Marfa, but her first foray into minimalist design-minded lodging was Hotel San Jose. Dense webs of vines along the exterior and corridors give the bungalow rooms a sense of seclusion, despite being mere feet from one of Austin’s busiest shopping districts. The rooms are spartan but chic, with vintage concert posters and colorful accent walls and pillows contrasting the austere blonde wood furniture. Before retiring, don’t miss the hotel bar, which offers one of the best micheladas in town. When Heywood Hotel opened in 2012, Cesar Chavez St. had just begun transformation into one of the city’s hippest neighborhoods. Now that it’s a hotbed of retail and upscale restaurants, Heywood serves as a middle point between the past and present, a 1925 bungalow outfitted with seven suites marked by timeless interior touches like longleaf pine floors and cathedral ceilings, mixed with modern locally-made furnishings, from handcrafted bed-frames to throw pillows designed by local artists. One of the city’s best taco trucks, Veracruz All Natural, is just down the street—ride there on one of Heywood’s complimentary bicycles. 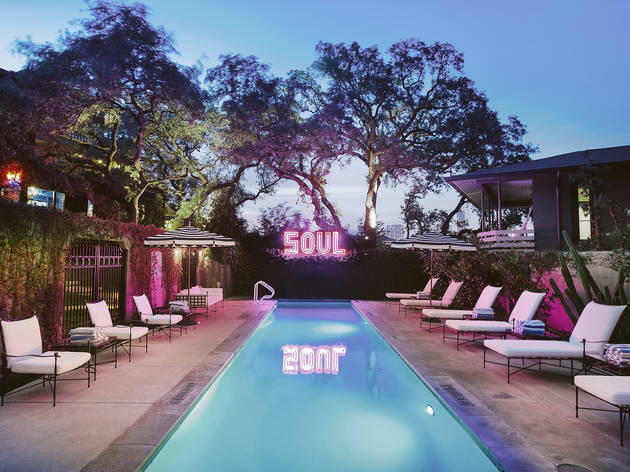 The more upscale cousin of Hotel San Jose, Hotel Saint Cecilia offers a luxurious take on Austin’s signature style of effortless cool. Named after the patron saint of music and poetry, Saint Cecilia aims to be the type of place where a modern-day version of the Stones might record their Exile on Main Street. In fact, the Foo Fighters did just that and named their 2015 EP after the hotel. 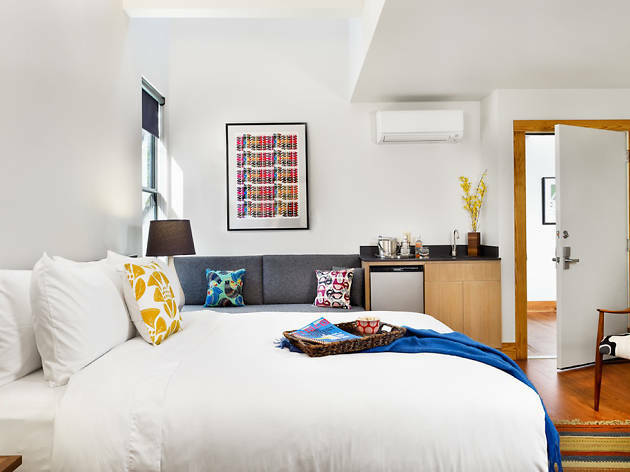 The 14 rooms are all equipped with organic beds from legacy Swedish manufacturer Hastens, kimono bathrobes, and body care products from revered NYC perfumery Le Labo. 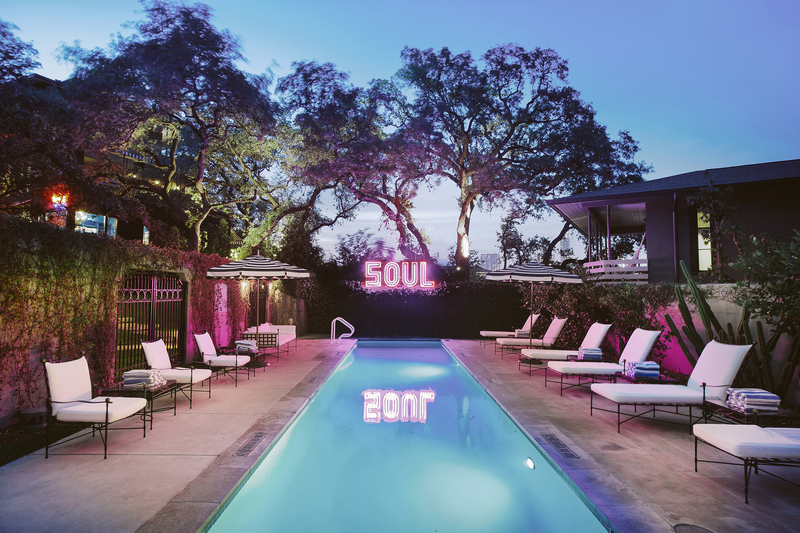 Check out a record from a library of vintage vinyl for listening on their Rega turntables, but make sure to bring your swimsuit: the 24hr, 50-foot heated lap pool, illuminated by a neon sign reading “Soul” makes for a great lifeguard. 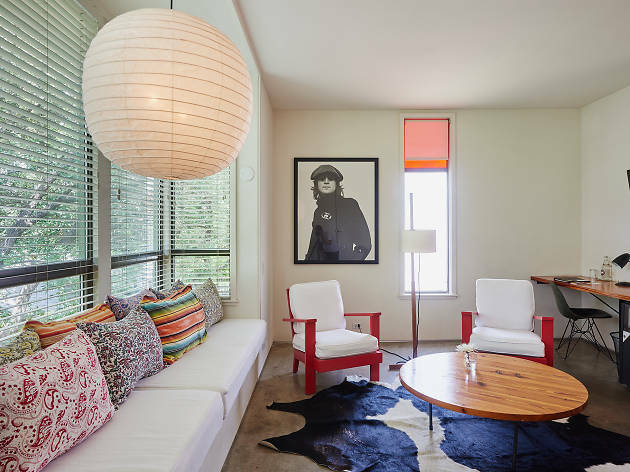 Helmed by the hospitality group behind downtown interior Mexican standby La Condesa and Thai favorite Sway, South Congress Hotel offers 83 rooms of understated luxury, but a stay at the South Austin newcomer offers much more than just slumber. Between the three restaurants (classic American at Central Standard, light kale salads at Café No Sé, and pricey omakase from Otoko), coffee shop (Mañana), lobby bar with live DJs, and retail from vintage gearheads Revival Cycles, it’s worth blocking off a weekend just to explore the grounds. 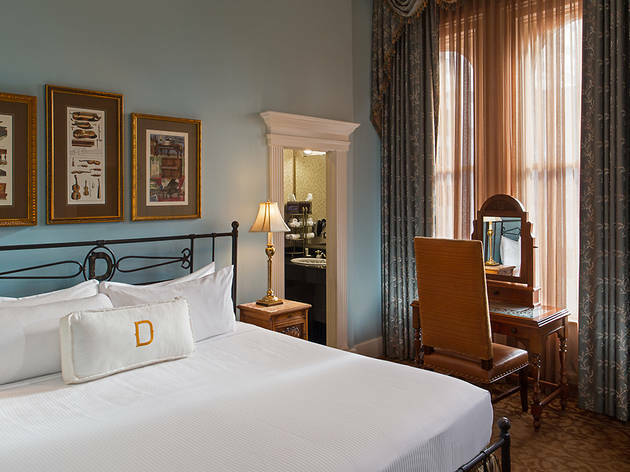 Austin’s status as the festival capital of the world has sprung up an array of boutique lodgings, but the Driskill was around long before the boom of badgeholders. Built in 1886, the influence of the developer (a cattle baron, naturally) still exists in the form of hide-upholstered couches and longhorn busts hanging in the bar. 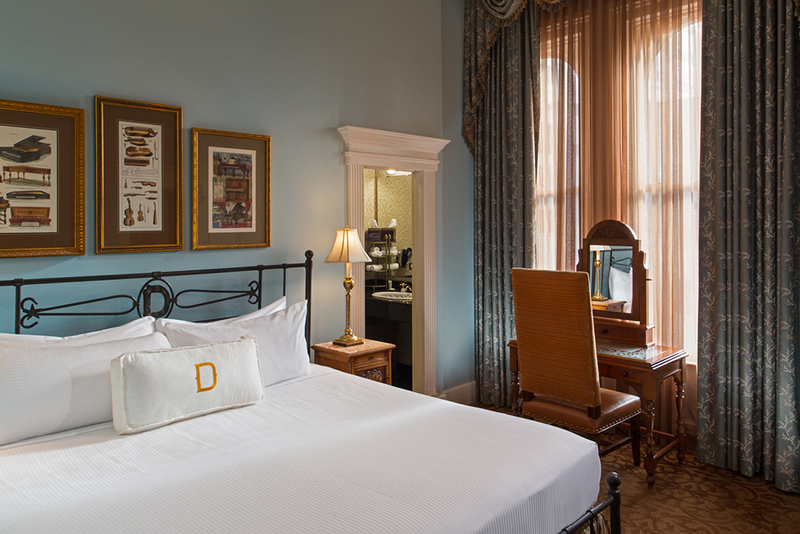 The rooms exude old-school Texas elegance: think vintage crown molding, calming desert gold and tan linens, and pearly white accents. The Pampered Pet program makes this one of the most dog-friendly hotels in town, unless your canine is particularly in touch with the spirit world—legend has it that the halls are haunted by two ghostly brides who took their lives on their wedding nights 20 years apart, but in the same room. 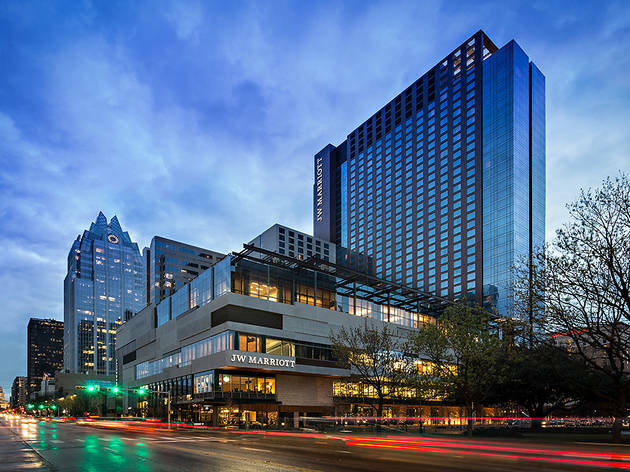 Located adjacent to the Moody Theater (home of ACL Live), the W serves as a cornerstone of the posh Second Street District. The Living Room bar is one of the best places in town to make very bad decisions and the summer rooftop pool parties are the stuff of legend, but the rock-star atmosphere doesn’t stop at poolside DJ sets. Twiggy floor lamps, suede sofas and ultra high-end McIntosh McAire sound systems mean the “Extreme Wow Suites” live up to their name. Thankfully all the revelrous vibes are tempered with a full-service spa, and one of the city’s most notable farm-to-table dining experiences at TRACE. Only slightly younger than the Driskill (est. 1900! 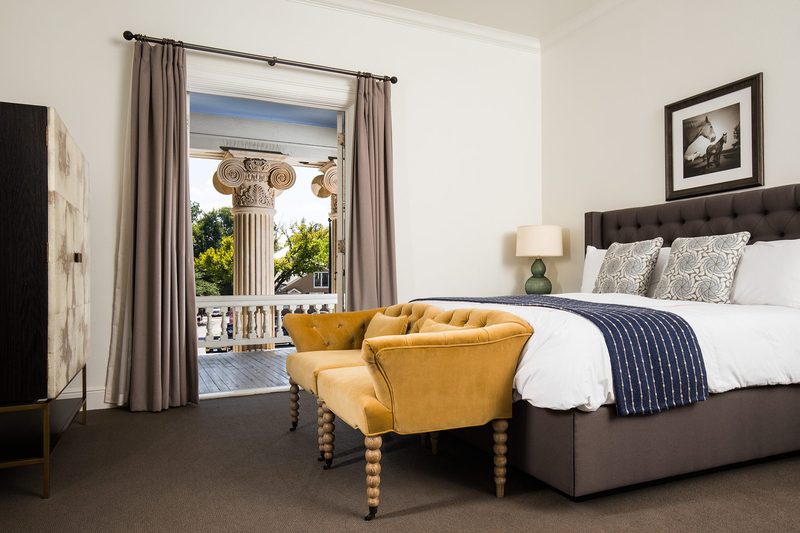 ), Hotel Ella is a love letter to its original curator, Ella Wooten, who transformed the mansion into a Greek-inspired pinnacle of then-contemporary design, aided by interior advice from the president of luxury retail chain Neiman Marcus. 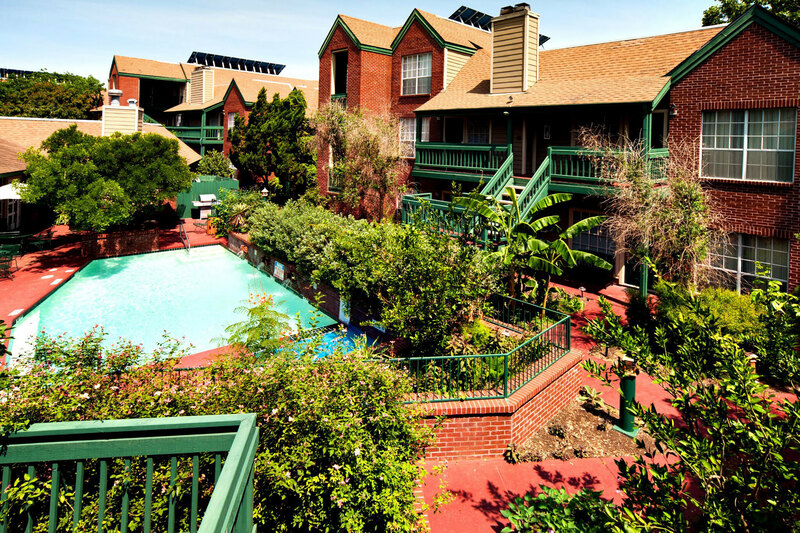 Since Wooten’s death in 1942, ownership has repeatedly changed hands, but the hotel has settled into a modern-day recreation of Wooten’s original ideas of sophisticated living. 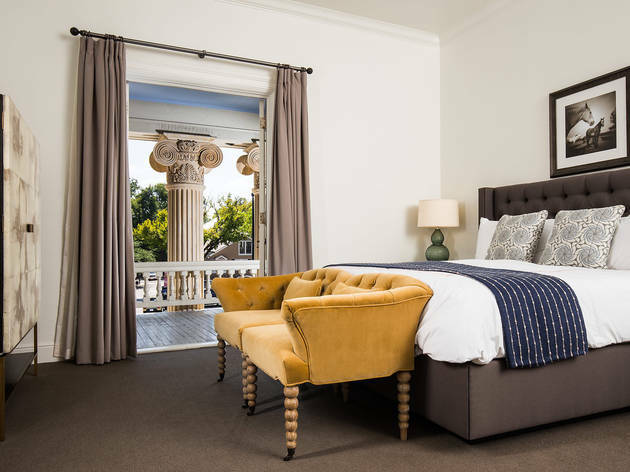 The 47 rooms (10 suites) aim for classic-but-not-stuffy elegance, with the highest-end suites featuring floor-to-ceiling French doors that open onto a veranda balcony. The nostalgia stops there though, as amenities like locally stocked minibars and New American in-room dining from Goodall’s Kitchen. 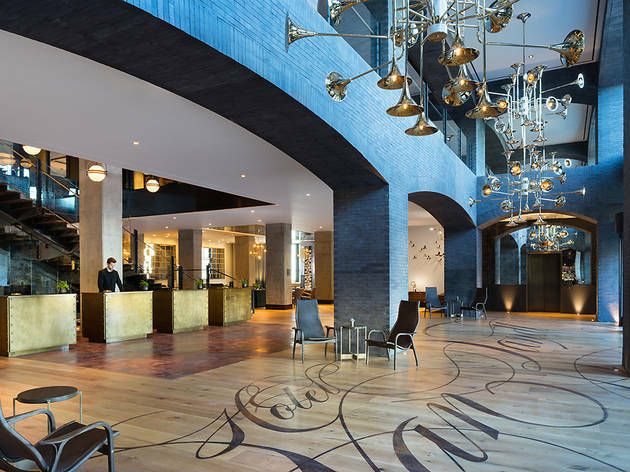 One of the city’s newer boutique options, Kimpton’s Hotel Van Zandt is located in the heart of Rainey Street, formerly a strip of sleepy bungalows that has morphed into the city’s premiere bar-hopping district. 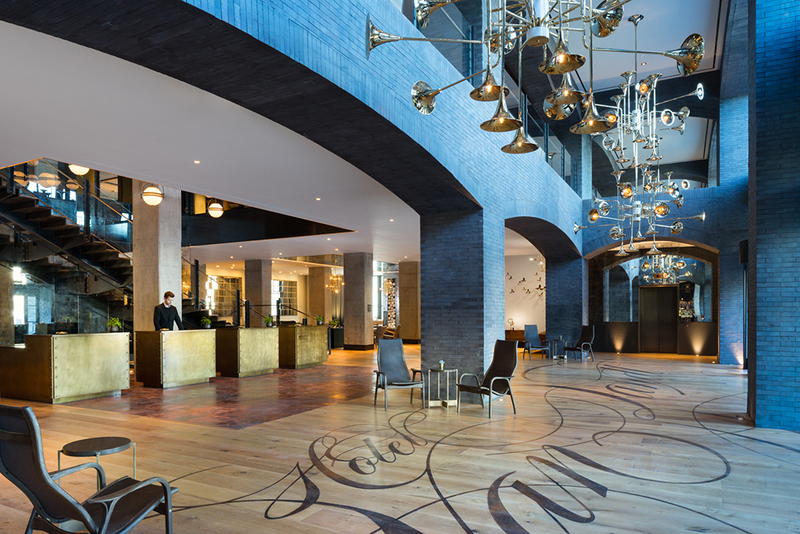 With one of the most impressive lobbies in town (the light fixtures made from trombone bells are truly stunning), restaurant Geraldine's offering views of Lady Bird Lake and live music seven nights a week, it’s an undeniably hip place to be seen—but an even hipper place to stay. Van Zandt's 319 rooms means there’ll likely be availability, dark woods and patinated bronze fixtures add intrigue, and soaker tubs overlooking the cityscape make your stay that much more special. 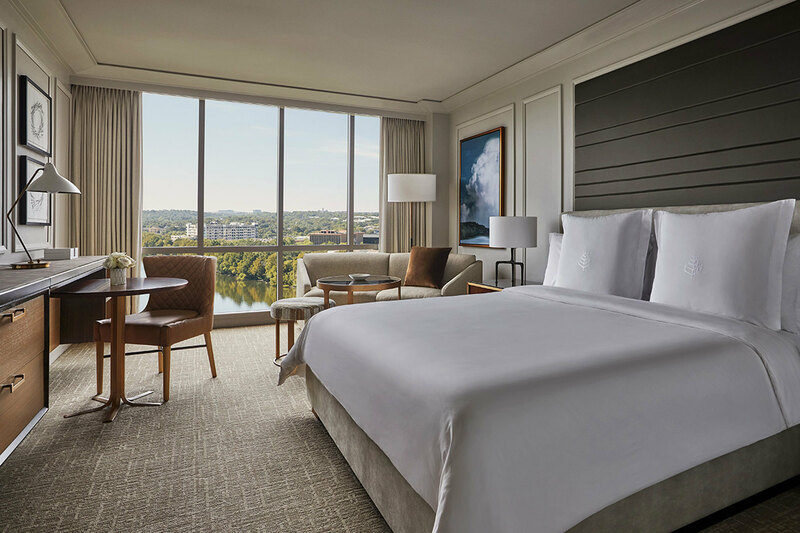 Occupying perhaps the most expensive strip of real estate in downtown Austin, the Four Seasons is nestled up against the Lady Bird Lake hike and bike trails, which makes it a perfect gateway to one of the city’s most iconic natural amenities. 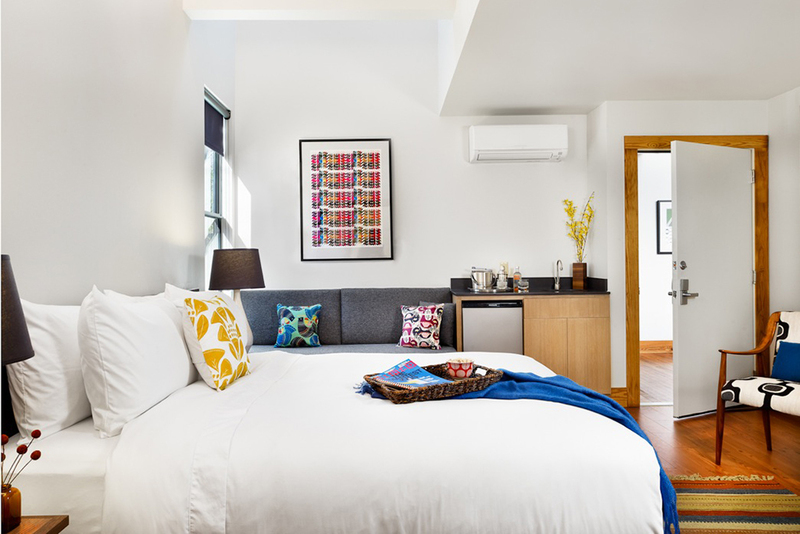 The hotel's 294 rooms and suites recently went through multi-million dollar renovations, which included upgrades to the decor along with the addition of Snooz white noise machines and Bluetooth-enabled Soundlink Minis in each guest room. Evening in-house car service and twice-daily housekeeping are the type of practical amenities that make this a more boutique option, not to mention the heated saltwater pool, spa (check out the allergy relief massage during Cedar Fever season), lawn hammocks and chimineas with complementary S’mores kits. The hotel restaurant, TRIO, focuses on local produce direct from East Austin's Springdale Farm and pork from Richardson Farms in Rockdale, Texas. For visitors with an eye for Eames, the Kimber is the move. Built in 2008 from the ground up by local architect Burton Baldridge, the seven-roomer hidden behind South Congress Ave is one of the city’s best-kept hotel secrets. The illusion of seclusion comes thanks to the hillside design, whose unassuming front façade shields a stunning water feature shaded by a one hundred-year-old live oak tree. 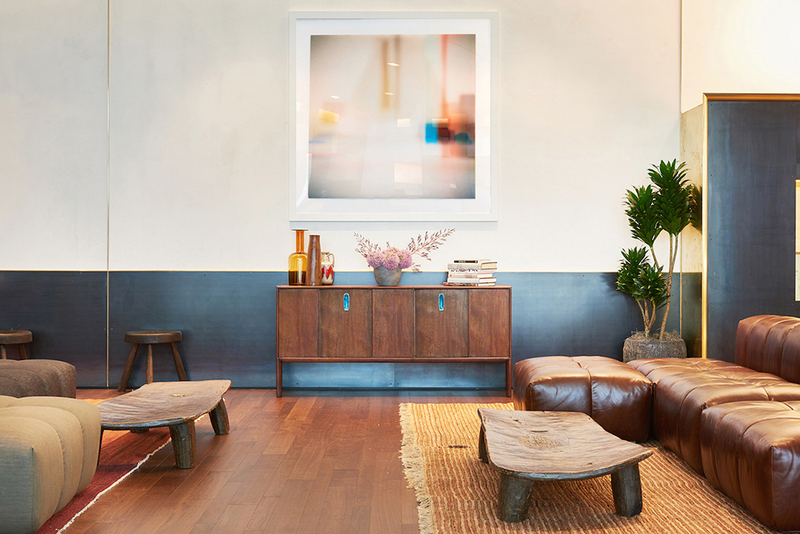 Rooms are adorned with paintings from nationally lauded local artists (one lives just two blocks away) and the aforementioned Eames chairs, plus the full line of Malin and Goetz bath products are on-hand for freshening up. 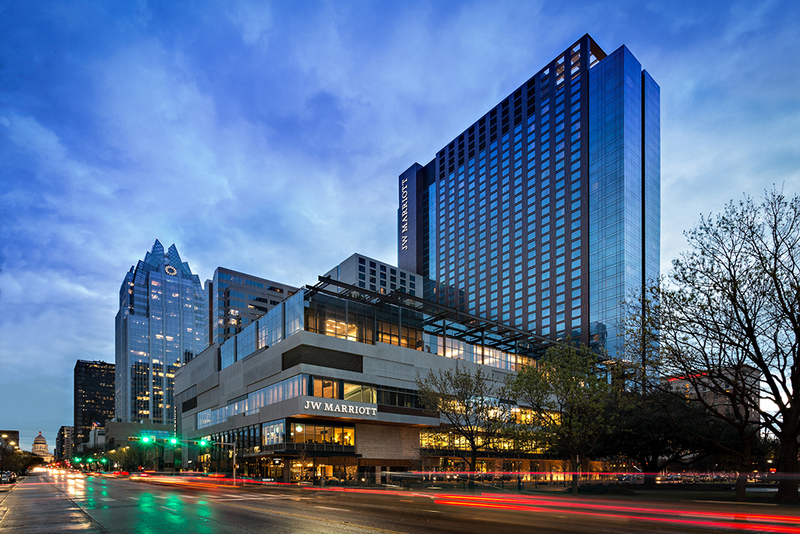 Longtime Austinites are still getting used to the 34 story, 1,012 room JW Marriot that was recently erected in the heart of downtown, but given the city’s floods of conference attendees and festival-goers, the massive footprint is well-warranted. The JW is Austin’s most business-friendly hotel, with entire floors of meeting rooms equipped with state-of-the-art AV capabilities (and an all-important Starbucks in the lobby), but still plenty of amenities for unwinding, like a rooftop pool adorned with an outline of Texas on the bottom. While you’re taking a dip, don’t miss one of the poolside bar’s signature frozen cocktails or the poblano hummus. 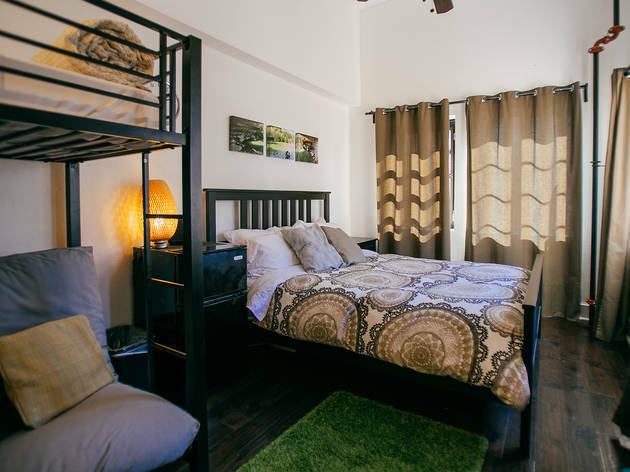 Visiting Austin on the cheap these days is a challenge, but one way to significantly decrease the damage of a weekend trip is to score one of the few rooms at the Firehouse Hostel. It isn’t the Four Seasons, but the oldest-standing fire station in Austin has been transformed into a cozy respite for budget travelers just feet from the fray of Dirty 6th Street. 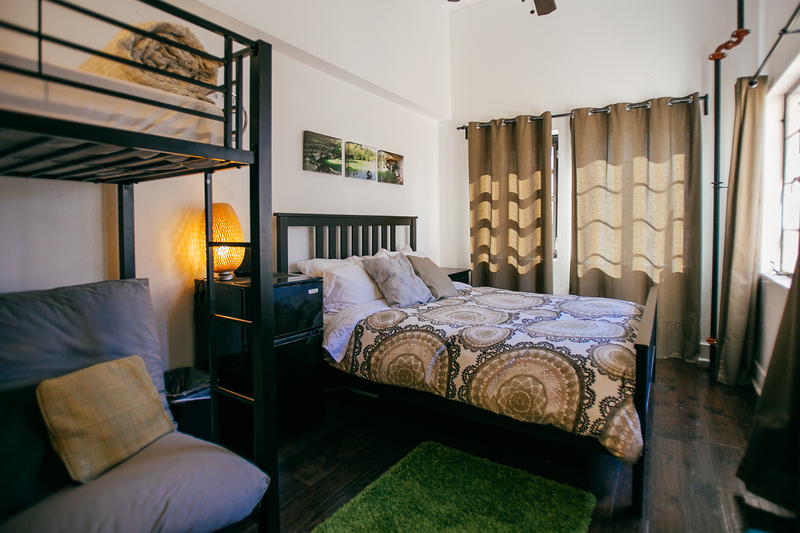 Standard and deluxe dorm offerings are great for large groups, but for those who’ve outgrown the charms of sleeping in the bunk beds they also offer a pair of more conventional suites with private baths. Bonus points for a cocktail lounge that you enter through a secret sliding false bookshelf. 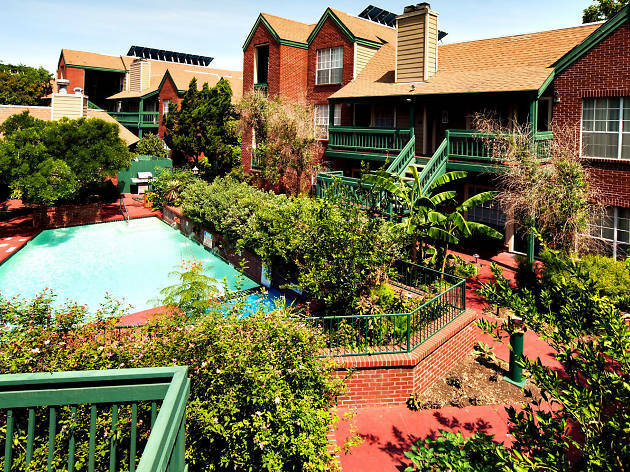 Looking for more affordable hotels? Our favorite hotel picks that won't break the bank.